吕洁毅, 何振毅, 丁国允, 刘谢, 伍华驹, 张才志, 王忱. 硫酰氟熏蒸杀灭蜚蠊卵荚剂量与时间的量效学研究[J]. 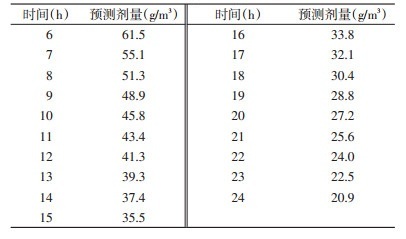 中国媒介生物学及控制杂志, 2018, 29(3): 279-282. LYU Jie-yi, HE Zhen-yi, DING Guo-yun, LIU Xie, WU Hua-ju, ZHANG Cai-zhi, WANG Chen. Study on the fumigation effect of sulfuryl fluoride on Blattaria's ootheca with different dose and time[J]. Chin J Vector Biol & Control, 2018, 29(3): 279-282. Abstract: Objective To study the fumigant effect of sulfuryl fluoride on Blattaria's ootheca and to explore the relationship of the dose and time. Methods We separated the oothecas of Periplaneta americana into different groups in the laboratory. We used sulfuryl fluoride to fumigate them and then observed their hatching situation. All the experimental data were fitted by the trend surface model and verified by field experiment. 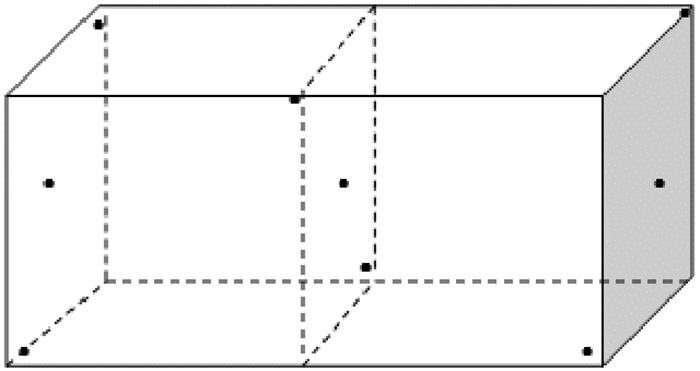 Results The trend surface model of the ootheca of the P. americana was statistically significant (F=26.776, P < 0.000 1, R2=0.918). The model effectively predicted the dose and time relationship of the Blattaria's oothecas killed by sulfuryl fluoride. 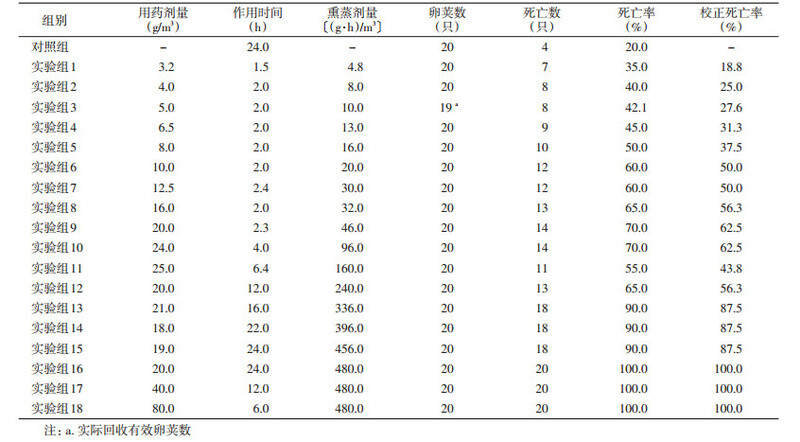 The field killing rate of the ootheca was 100% based on the initial concentration of 36 g/m3, the dosage of 2.7 kg and the fumigation time of 20 h which according to the predicted dose-time data and fumigation dose formula. Conclusion According to this study, we calculated the optimal dose-time model of sulfuryl fluoride to kill the Blattaria's ootheca. And we can guide the port to carry out fumigation and insecticide work of containers more effectively. 廖如燕. 口岸卫生处理现状及其研究发展方向[J]. 中国国境卫生检疫杂志, 2009, 32(5): 396-399. 郑京飞, 黄克迈, 安鹏天, 等. 一起入境船舶携带输入性蝇蛹并羽化出成蝇的案例分析[J]. 口岸卫生控制, 2014, 19(6): 57-58. 宋锋林, 王敏杰, 李建训, 等. 国境口岸首次从入境媒介昆虫中检测到寄生虫虫卵[J]. 中国国境卫生检疫杂志, 2006, 29(4): 221-224. 田洁, 郭惠琳, 黄健华, 等. 境外宠物蜚蠊传入风险及控制[J]. 中国媒介生物学及控制杂志, 2013, 24(6): 558-560. 郑剑宁, 李望昌, 裘炯良, 等. 硫酰氟熏蒸剂量计算方法[J]. 中华卫生杀虫药械, 2009, 15(1): 46-48. 王殿轩, 卢奎, 赵俊廷, 等. 真空熏蒸快速杀虫试验研究[J]. 郑州粮食学院学报, 1999, 20(3): 11-15. 中华人民共和国卫生部. GB/T 26347-2010蚊虫抗药性检测生物测定法[S]. 北京: 中国标准出版社, 2011. 郑剑宁, 裘炯良, 杨定波. 硫酰氟在有害生物控制中的应用研究[J]. 中国媒介生物学及控制杂志, 2007, 18(1): 73-75. 中华人民共和国国家质量监督检验检疫总局. SN/T 1760-2006出入境口岸硫酰氟卫生处理应用规程[S]. 北京: 中国标准出版社, 2006. 张瑞峰, 程瑜, 杨菲, 等. 2种不同熏蒸剂对舞毒蛾不同虫态的杀灭效果[J]. 植物保护, 2013, 39(4): 164-167. American Society for Testing and Materials. ASTM E 654-1996 Standard test method for effectiveness of aerosol and pressurized spray insecticides against cockroaches[S]. West Conshohocken, PA: American Society for Testing and Materials, 1996. 谭巧云, 杨永寿, 李开凤, 等. 美洲大蠊卵鞘中16种元素分析[J]. 大理大学学报, 2016, 1(4): 22-25. 刘小真, 王纲荣, 万筱荣, 等. 硫酰氟、溴甲烷联合熏蒸集装箱消毒杀虫灭鼠效果[J]. 中国媒介生物学及控制杂志, 2005, 16(1): 19-20. 陆永贵, 丁永健. 口岸卫生处理实用手册[M]. 南京: 东南大学出版社, 2010: 260-261.